As we observe the centennial of the March 1, 1919 Movement (aka “Mansei Movement” or “Sam Il Undong” in Korean) this year, it is a timely opportunity to study the critical role that San Francisco played in the early Korean immigrant community and its independence movement in the mainland U.S. The fight for independence and early Korean immigration history are intricately connected, and unbeknownst to many, San Francisco was at the nexus of the two for a number of reasons. San Francisco was the main port of entry on the west coast from the late 1800’s to 1940 and most early Korean immigrants to the mainland U.S., including many political exiles and student activists, first landed here. The peak period of the first major Korean migration into the mainland U.S., roughly from 1903 to 1917, coincided with Japan’s increasing aggression in Korea with Japan’s declaration of Korea as its protectorate in 1905 and its annexation of Korea in 1910. So as these early immigrants landed in San Francisco, restoring Korea’s independence was the paramount issue on their mind. Last but not least, as a port city, San Francisco was a convenient, centralized place for the leaders to meet as well as to organize the early immigrants who were small in number and spread out widely across California and the western states. By virtue of geopolitical events, location and timing, San Francisco was where Koreans in the first two decades of the 1900’s began the work of organizing a new immigrant community and their independence movement from America. *Source Note: U.S. Census data for the mainland from 1910–1950 seems to grossly undercount the Korean population as the census numbers do not reconcile with data from community sources and immigration records. The undercounting may have been due to the transient nature of many Korean immigrants’ lives. Because official data are not reliable, many sources provide guesstimates that vary by 500 to 1,000 in any given year. The numbers provided here are the generally accepted range of population estimates provided in several sources: Shinhan Minbo, December 13, 1917; Wayne Patterson, The Ilse First-Generation Korean Immigrants in Hawaii, 1903–1973; Won-yong Kim, Jaemi Hanin Oshipnyun Sa; and Richard S. Kim, The Quest for Statehood: Korean Immigrant Nationalism and U.S. Sovereignty 1905–1945. It is also important to note that the momentum of Korean immigration shifted away from Hawaii and to the mainland quite early in the history. The first large wave of Korean immigrants came to Hawaii starting in 1903 to work at sugar plantations and the Korean population in Hawaii reached a high of about 7,200 by 1905. However, such migration was short-lived and stopped abruptly in 1905 when Japan, having declared Korea as its protectorate that year, placed a ban on further emigration of Korean laborers to Hawaii. The purpose of the ban was to protect the interest of Japan and the Japanese in America. The influx of Korean laborers in Hawaii had kept wages low and had caused Japanese laborers to migrate to California, which in turn fueled strong anti-Japanese sentiments in the mainland. The Japanese government feared that such sentiments would lead to the passage of a Japanese Exclusion Act similar to the Chinese Exclusion Act and believed the best way to stop that from happening was to prevent Korean laborers from coming to Hawaii altogether. With no new Korean laborers coming to Hawaii starting in 1905, combined with thousands of Korean laborers who either returned to Korea or transmigrated to the mainland U.S., the size of the Korean population in Hawaii was stuck at around 4–5,000 for the next 50 years.⁴ In contrast, Korean migration to the mainland U.S. through San Francisco as the gateway increased, albeit gradually, starting in 1905. The independence movement in America and Korea took a different path from the very beginning. Given Japan’s comprehensive repression of social and political life in Korea starting as early as 1905, including travel restrictions and ban on public assembly, Koreans in Korea had a much harder time than Koreans in America in mounting an anti-Japanese movement. The independence movement that started in Korea on March 1, 1919, was possible only because Koreans were allowed to gather freely for the first time since the annexation to grieve for their late King Kojong in a public funeral set for March 3.⁵ In contrast, Koreans in America were free to organize their anti-Japanese movement from the moment they arrived in the U.S. And that they did. As early as 1905, San Francisco Koreans in particular were methodical in organizing, strategizing and engaging the community, to respond to the fateful events that were unfolding in Korea. 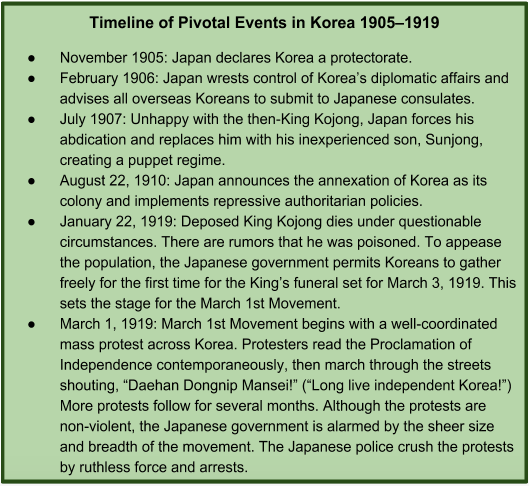 According to Warren Kim (Korean name, Kim Won-yong), an early Korean immigrant and community historian, the anti-Japanese and independence movement in America can be divided into three core phases, each corresponding to a pivotal event in Korea.⁶ The three phases with the corresponding events are listed below, followed by a detailed discussion later in the article. San Francisco Koreans were most influential in laying the groundwork in organizational infrastructure and communication network in the first two phases. San Francisco Koreans: Who Were They? According to community estimates, over 2,000 Koreans arrived in San Francisco by 1918 and lived in the mainland U.S., with over half of that number living in California, and the rest spread out in the western states working on farms, railroads and mines.¹⁰ Memoirs and newspaper articles from that period confirm that Korean settlers lived as far and wide as Washington, Idaho, Wyoming, Colorado, Utah and Nebraska. The early Koreans who landed in San Francisco can be divided into three distinct groups: Korean laborers transmigrating from Hawaii, a small group mostly of political exiles and student activists who came before 1910, and a larger group consisting of students, family members and picture brides who landed after Japan’s annexation of Korea in 1910. 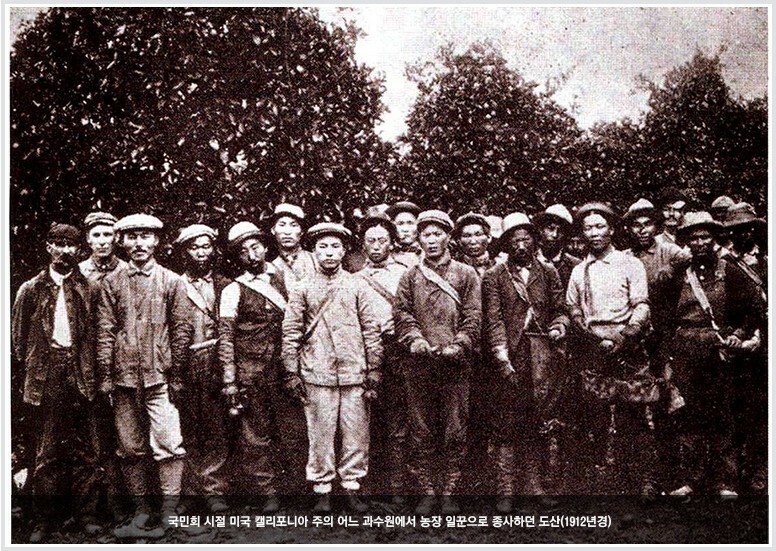 Ahn Chang-ho (third from left) with Korean farmworkers at a California orchard, circa 1912. Source: Warren Kim, Koreans in America, 11–24. 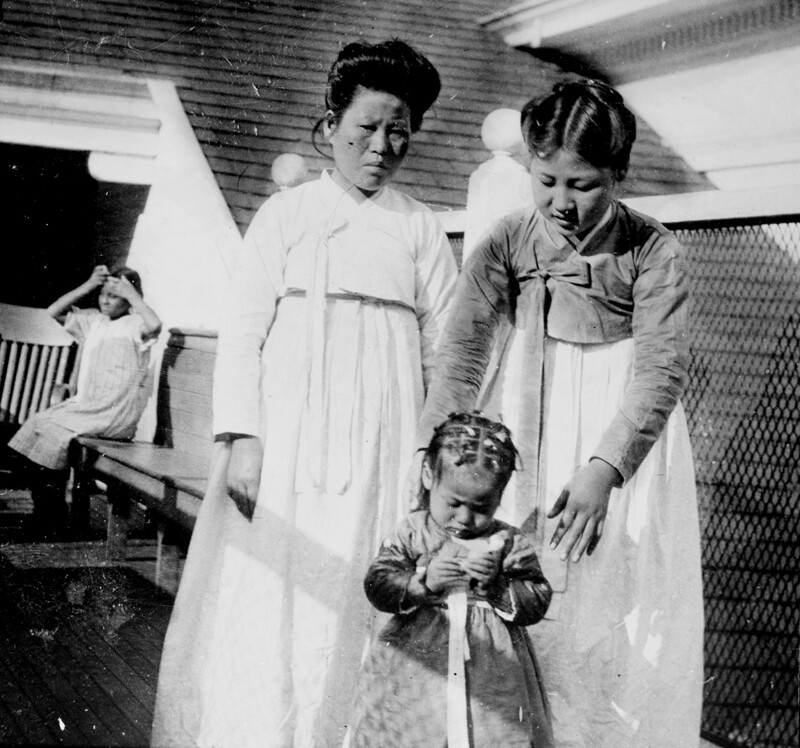 3-yr-old Rose Paik with her mother and sister at Angel Island, 1914. As mentioned earlier, while Hawaii had the larger population, San Francisco in the early years stood out as the command center for community organization in the mainland U.S. Having San Francisco as a centralized location was critical for organizing the widely scattered population living up and down California and across the western states. All of the San Francisco organizations, with the exception of the very first organization, the Friendship Society, had a dual mission: to support each other in America and to fight against Japan’s aggression in Korea. All of the organizations also had publications that played vital roles in communicating news about the community as well as about Korea with the scattered population. Collectively, these organizations and publications became the building blocks for growing the nascent immigrant community and its independence movement in America. In 1905, the Friendship Society expanded into the Gongnip Association (official Korean name Gongnip Hyup Hui meaning Mutual Assistance Association), the first Korean political organization on the mainland U.S. Its first office was located at 938 Pacific Avenue in San Francisco. The founding of the Gongnip Association was in direct response to Japan’s declaration of Korea a protectorate in 1905 and its express mission was to resist against Japanese aggression in Korea. Gongnip Association, the first Korean anti-Japanese political organization in the mainland, was established in San Francisco in 1905. Front (L-R): Song Suk-jun, Yi gang, Ahn Chang-ho. Back (L-R) Im Jun-ki, Jung Jae-kwan. 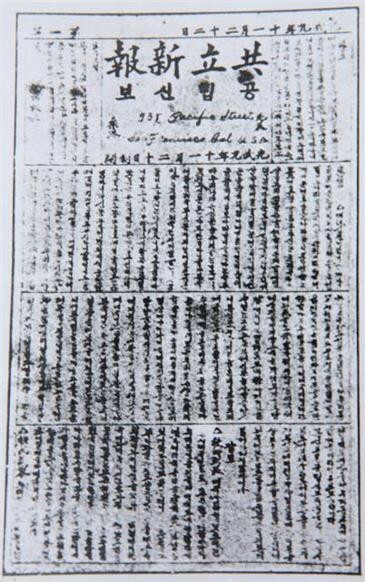 For a brief period from 1907 to 1908, Daedong Association published a newspaper called the Daedong Gongbo (literal translation, The New Korean World). It too was handwritten initially, then switched to printing with a movable type in late 1907. Unfortunately, the newspaper quickly ran into financial trouble and had to stop publication altogether by April of 1908.⁵³ Interruption in publishing due to financial issues was a common problem for all Korean publications. The rapid establishment of community, religious and political organizations by the early San Francisco Koreans reflected their pent-up desire to do what they could not do at home: organize and disseminate news without censorship. Upon declaring its protectorate status over Korea in 1905, the Japanese government immediately resorted to repressive means to quell Korean opposition by stopping the publication of Korean newspapers, disbanding all political organizations, forcing political organizations to go underground and prohibiting public gatherings.⁵⁴ The ability to organize, together with the freedom to publish in the U.S., became the two greatest weapons with which the early Koreans could pursue a coordinated anti-Japanese movement not only in the U.S. but also in coordination with the diaspora community around the world including, Manchuria, Siberia, Hawaii, Mexico and Japan. The culmination of these organizational efforts was the establishment of the Korean National Association in 1908, an organization whose role in the community as well as the independence movement was so vital that it deserves a separate section. Unfortunately, in January 1922, factionalism within the organization caused KNA’s central headquarter to be dissolved and reorganized.⁶¹ Although the KNA went through internal strife and reorganization, it continued its operation and served the Korean community until 1988. The Shinhan Minbo (literally meaning people’s newspaper for a new, revitalized Korea), was the official newspaper published by the San Francisco KNA starting in 1909. Rev. David Lee was one of the leading editors and contributing writers. The Shinhan Minbo was a weekly Korean newspaper focused on news and editorials about the political situation in Korea and the world as well as stories of interest in the local Korean community such as recent arrivals and those returning to Korea, illnesses and deaths, and labor recruitment notices by employment brokers.⁶² One consistent focus of the newspaper, in the words of Professor Richard Kim, was “to link the welfare and well-being of Koreans abroad with the struggle for the independence of their homeland.”⁶³ According to Professor Kim, editorials were often addressed to “my fellow people of America and Hawaii,” reminding them that Korea’s future depended on them and declaring “an almost providential mission to aid their homeland.” The Shinhan Minbo always had several columns dedicated to news from the various KNA local chapters and listed contributions made by individuals by name and amount. It had a circulation of about 3,000: 700–800 in the mainland U.S., 500 to 600 in Hawaii, 400 in Mexico, and the balance in Manchuria and Siberia.⁶⁴ The Shinhan Minbo would become the longest circulating Korean newspaper, lasting through the 1970’s. The KNA’s critical role in the early Korean immigrant community cannot be overstated. It had a highly organized structure that allowed for efficient administration of the scattered population through its regional headquarters and numerous local branches. 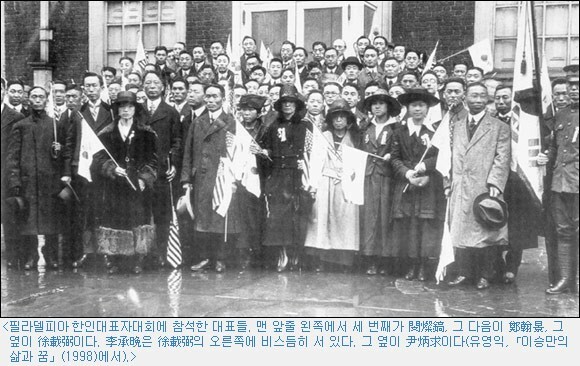 It was also a vital training ground for Koreans in America to learn how to advocate for themselves and fundraise before the independence movement went into high gear starting in 1919. Most importantly, the KNA’s greatest strength was in its ability to respond to local events that amplified the geopolitical situation in Korea in a way that gave voice and structure to the anti-Japanese sentiments of the Koreans in America. Some of its key involvement in the community are discussed below. Trial of Jeon Myeong-un and Jang In-hwan. 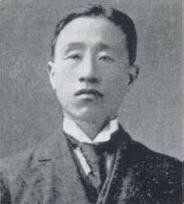 The murder trial of Jeon Myeong-un and Jang In-hwan for the assassination of American diplomat Stevens was the catalyst for the consolidation of multiple Korean organizations into the KNA in 1908. This was a high-profile event that happened right here in San Francisco. More significantly, it was the first time that Koreans in America galvanized around the defense of their countrymen against those who they perceived as agents of Japan. 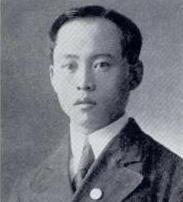 Jeon was released in June of 1908 on grounds of insufficient evidence for conspiracy. The trial of Jang concluded in January of 1909, with Jang being found guilty of second degree murder and sentenced to 25 years at San Quentin maximum security prison. While this was a long sentence, Jang was spared from the death penalty. The early Koreans were beginning their lives in the mainland U.S. as pivotal events were unfolding in Korea from 1905 to 1919. Much as the establishment of the KNA was a direct response to the Jeon-Jang murder trial, the organizational efforts and anti-Japanese activities of the San Francisco Koreans directly correlated to the events in Korea, in three core phases. The organizational work of the San Francisco Koreans were particularly significant in the first two phases. When the Japanese diplomats attempted to gain the immigrant community’s support, the Koreans in America were disciplined and united in refusing Japanese interference into their affairs. The KNA was instrumental in establishing that Koreans in America were not Japanese subjects in what is commonly known as the Hemet incident. In June of 1913, a crew of Korean fruit pickers were recruited by apricot farmers in the town of Hemet in Southern California. When the workers arrived at the Hemet train station to report to work, however, they were physically threatened by an angry mob of anti-Japanese residents who mistook them to be Japanese and the workers were forcibly sent back on the same train.⁷⁶ “LITTLE BROWN MEN ARE ORDERED BACK: Korean Fruit Pickers, Mistaken for Japanese, Are Sent Away from Hemet” read the title of a June 27, 1913 article in the San Francisco Chronicle. Rev. David Lee, as president of the KNA, took the matter directly to Washington D.C. by sending an urgent telegram to the U.S. Secretary of State William Jennings Bryan arguing that the Korean fruit pickers were not Japanese subjects because they had left Korea before the Japanese annexation of Korea and therefore, neither Japan nor Japanese organizations had any right to intervene on their behalf. On July 2, Secretary Bryan, responded to Rev. Lee’s telegram affirming that Koreans in America were not Japanese because most of them had left Korea before the annexation and that the U.S. would deal with the KNA on all matters relating to Koreans.⁷⁹ From then on, the KNA became the unofficial representative of all Koreans in America. Korea’s Independence Mansei! God help us! With the start of the March 1st Movement, the independence movement in America entered a whole new phase in which its role shifted from responding primarily to local and regional issues to one that was supportive of a worldwide coalition of Koreans fighting for independence. The KNA, with its vast organizational network that was built over a decade of strategic leadership, played a critical part. The expenses of all Korean [independence] movements in America and Europe shall be met by the patriotic contributions of Korean residents in the U.S., Hawaii and Mexico. The voluntary patriotic contributions shall come from every Korean resident in America and are to be paid at the offices of the Korean National Association in San Francisco and Honolulu. In September, 1919, a consolidated Provisional Government of the Republic of Korea (“KPG”) was established. It was headquartered in Shanghai, China, with Rhee Syngman as the president based in Washington D.C. The KPG was a presidential system of government, governed by a constitution, and with a 39-member national assembly representing 13 provinces of Korea and those overseas Koreans living in China, Siberia, Manchuria, Hawaii and the U.S.⁹⁰ The “patriotic contributions” that the KNA collected was the main funding source for the activities of the KPG.⁹¹ The control and use of the that fund, however, became the source of bitter factionalism within the Korean community in the U.S. in the 1920’s between Rhee and his loyal followers on the one hand, and the KNA leadership on the other, causing a permanent rift in the community. Finally, in March 1925, Rhee was impeached and removed from his post as the president of the KPG. 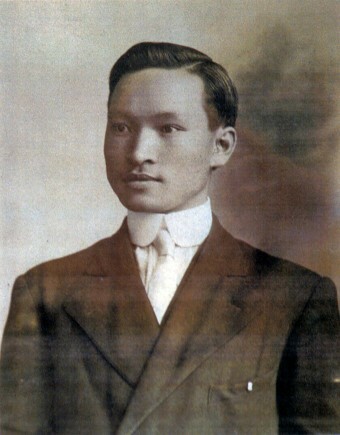 Upon his impeachment, Rhee continued his political activities through Dong-Ji-Hui, an organization and fundraising organ he established in Honolulu in 1921. Dong-Ji-Hui expanded in the mainland U.S. through regional chapters.⁹² Support for the independence movement by Koreans in America from this time on was permanently split into two: one that was composed of loyal followers of Rhee and those who chose to support the KPG through the KNA. The rift in the Korean community notwithstanding, the accomplishments of the San Francisco Koreans, in establishing the earliest political organizations, publishing the first newspapers and magazines, and in advocating for their rights as a community despite their small number, were truly admirable. 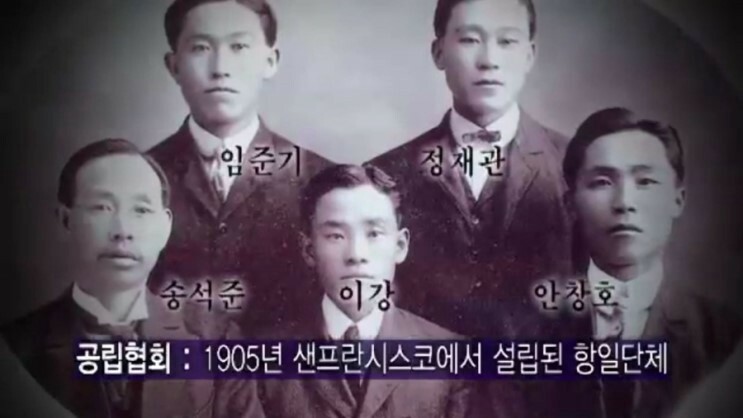 As new arrivals in the U.S., facing daunting obstacles and many barely speaking English, the San Francisco Koreans dared to embark on not just one but two uncharted paths: as immigrants and as political activists fighting for independence from Japan. Slowly but readily, as they worked through these challenges over the years, the San Francisco Koreans and their fellow early Koreans in the mainland became “Korean Americans”. To the reader: The endnotes for this article are provided as a separate publication. I extend my special gratitude to Dr. Kenneth Klein, the Head Librarian, and Ms. Joy Kim, the Curator of the Korean Heritage Library, of the East Asian Library at U.S.C. They were both incredibly generous with their time and assistance whenever I needed help with this research. Thanks to decades of their hard work, the East Asian Library at U.S.C. has one of the best archived collections of historical documents, periodicals and books about Korean immigration history. Passionate about history, especially the lesser known ones.